Income Institute Connect Reviews - Legit or Scam? Income Institute Connect Reviews – Legit or Scam? The sales page says that this opportunity can help anyone earn up to $87 an hour while being their own boss and being in control of their own schedule. Allen also claims that her program is a “certified, proven, and guaranteed way to make $379 a day,” with no special skills or previous experience. In addition, she claims that this type of money can be made working only 1-4 hours a day. 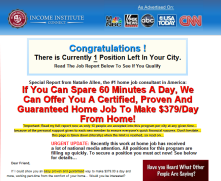 It only costs $97 to sign up for the Income Institute Connect certification program, and sign up includes a 30 Day Make Money Guarantee, which states that if you do not make money with the program in 30 days, you will be given your money back, no questions asked. The actual work being promoted by them is link posting, which is a type of affiliate marketing. When you post a link online for another company’s goods or services and someone clicks that link and makes a purchase, you will be paid a commission. Affiliate marketing is one of the most popular work at home opportunities available today, and it’s an incredibly competitive industry. While it is possible to earn a livable income with affiliate marketing, it takes a lot of time and effort to establish a profitable business. First, Income Institute Connect makes it seem incredibly easy to earn large sums of money quickly with affiliate marketing, which simply isn’t likely. It takes time and patience to build a home business. Second, while they claims to offer a 30 Day Make Money Guarantee, they offer no details of their refund policy in their Terms & Conditions, which means it may be very difficult to secure a refund should you actually need it. Third, they are definitely not “the only certified link posting program in the world,” as Reviewopedia has reviewed dozens of other companies who make the same claim. There is lots of free information available online about affiliate marketing and how it works. It is likely in your best interest to look at the free information to see what is involved in this work before you consider investing money in a training program. Average Rating for " Income Institute Connect " is 1.25 out of 5 based on 4 reviews. this company is scam , I lost my 97$ hard earned money. I called and called and no return call, they give me a user name and pass word that do not work.... people out there beware... this site is a Scammer. why to use credit card to get started on with work?what should a person like me do if she has no credit card?i am intrested to work online and in need of money too,but am helpless. i am trying to locate the contact details of one Kavitha Mehra of online profits.in and want to know why payments can be made from credit cards only or other mode of payment but unable to get the answers. in this website name of Income Institute Connect is mentioned. Looks like another scamster,out to extract your credit card information. This company is undoubtedly a scam and ought to be rooted out from the online market. First of all, one Jessica Will whilst driving her perhaps borrowed convertible car instructs visitors to their website to purchase back up software which will enable you to complete step 3 and earn $25 instant cash. This, I did rather sheepishly but earned no $25. To be sure, I emailed the Jessica and was informed via automated message that I will be attended within 48 hours. Later, Jessica (though without surname) emailed me stating that the Technical Department are looking into my case, and that's the last time I heard from her. Having said this, I also registered with $97 like other victims of these masked criminals without any benefit. Instead the useless self-acclaimed millionaire (whose voice was behind a powerpoint presentation) was luring me into purchasing further "Education Package" which he said will help me to earn thousands. All I did was to block one Jay Schraders from emailing me on behalf of this fictitious company, knowing fully that my credit card is the "pay as you go" type and need not worry further for any unauthorized withdrawal of my hard earned money. Home Cash Flow Solution or Income Institute Connect (whatever is called) encompasses all the features of a dubious and high level dupers. My advice is “buyers beware.” We all make mistakes this is one of them on my own part.